I just recently purchased this Primitives by Kathy friends box sign at the thrift shop. The box sign was attached to the top of the candle stick with a screw and washer. I ended up adding a another hunk of candle-holder base from my stash to the bottom. I just felt the piece was a little too tippy. So now this additional candle stick base with a LARGE hole (probably from a project fail) is added to the bottom. 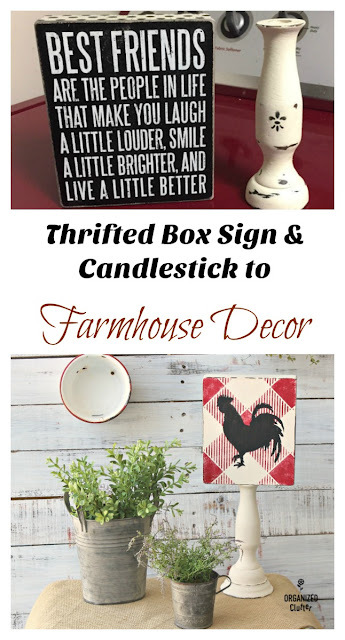 I painted my box sign and two candle stick parts with Chalked Paint in Chiffon Cream. 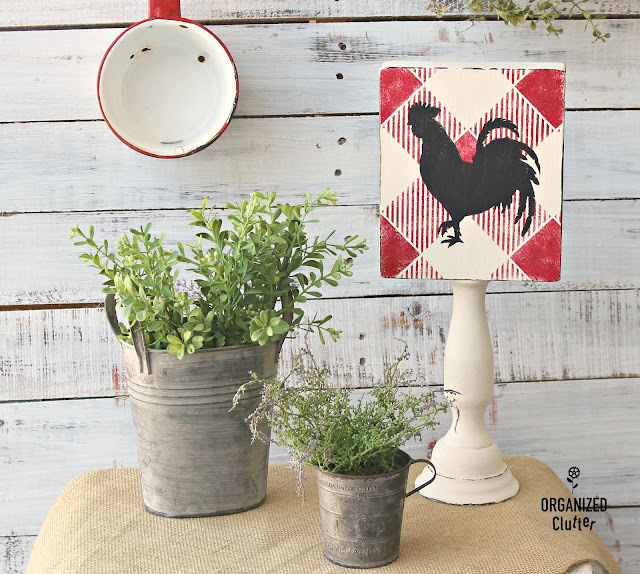 Chalked is a cheaper version of Annie Sloan Chalk Paint. 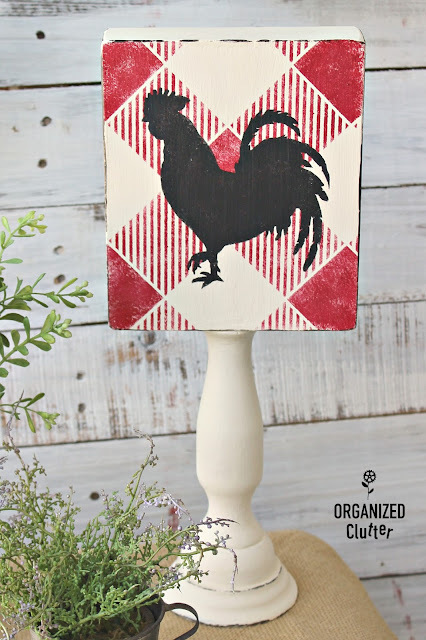 Next, I pulled out my favorite stencil, buffalo check, from *Old Sign Stencils. I stenciled the buffalo checks with Deco Art Chalky Finish Paint in Rouge. 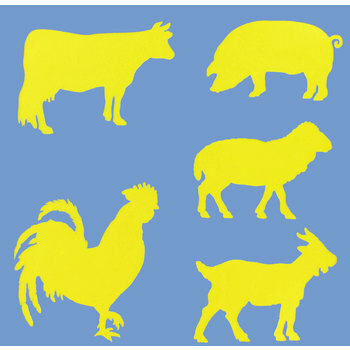 This farm animal stencil is from Hobby Lobby. I love the rooster stencil. I added it with Ceramcoat acrylic craft paint in black. I love red buffalo checks and black roosters! I used my FolkArt Layering Wood Block with Ceramcoat Craft Paint in Walnut Noyer to lightly distress the piece. I still love the layering block, but continue to learn new tricks with it. More information on the technique here. Sometimes I need to touch up after a boo-boo. I sealed this piece with a chip brush and Deco Art Creme Wax, 8-Ounce, Clear . 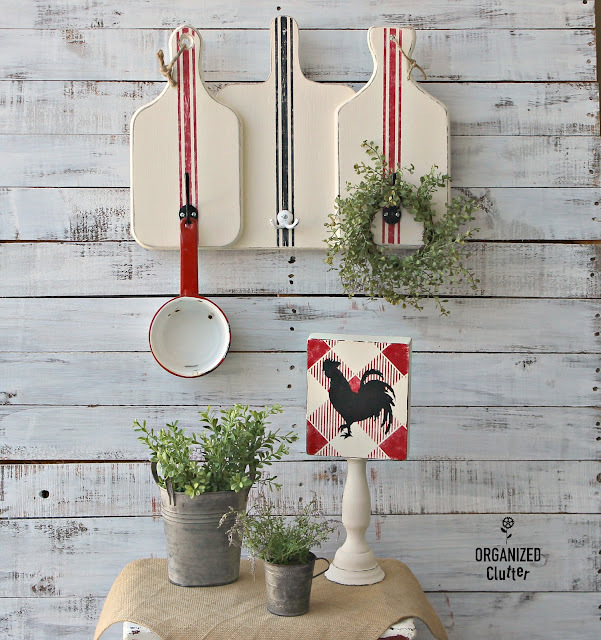 Add herb looking faux greenery to rustic pots and display along with the pedestal decor. 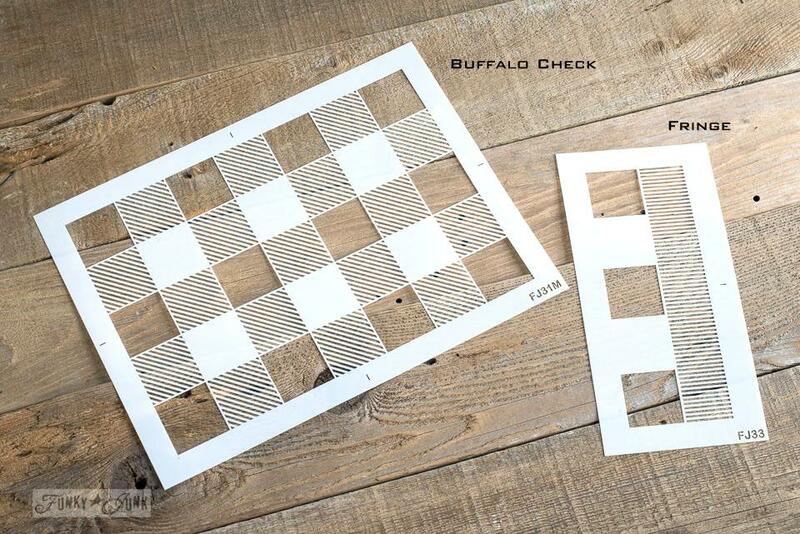 If you aren't a buffalo check fan, add a grain sack stripe with stencils from Old Sign Stencils. The thrift shop cutting board project is here. 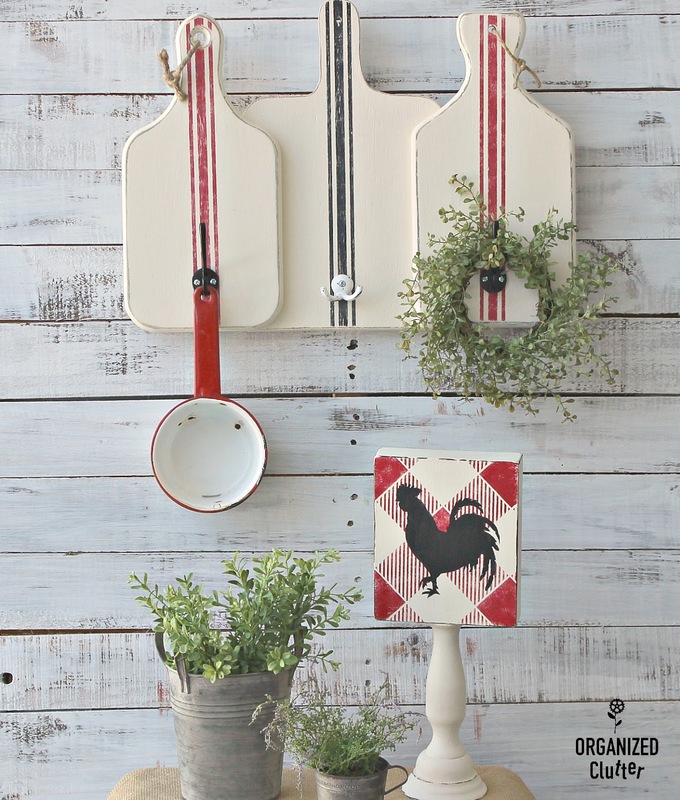 I love adding red accents to my decor! 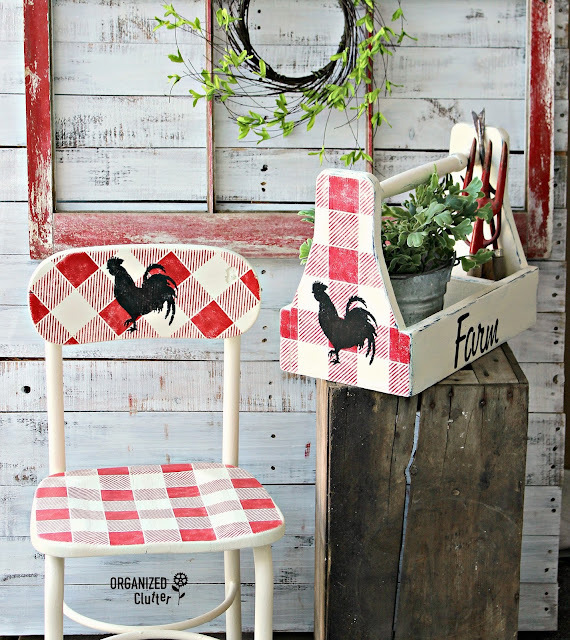 Love the whole farmhouse style vignette! You have great vision with the buffalo print!